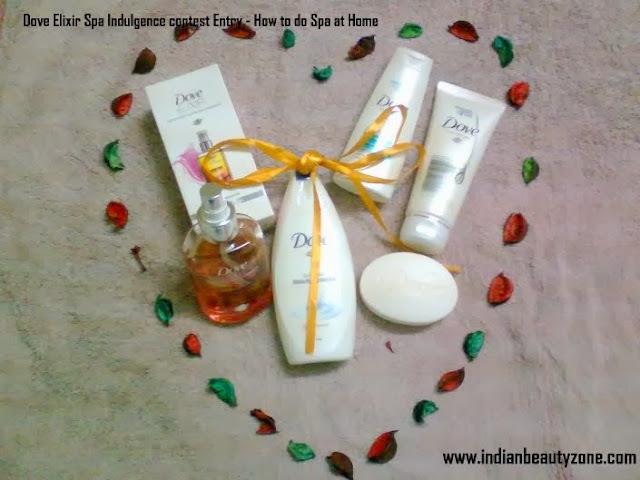 This is my entry for the Dove Elixir Spa Indulgence contest. I don’t know why I love massaging and oiling my hairs in a #Bath Tub May be because I can save time. On weekends I love spending my 1 hour in my bath tub filled with warm Water and some rose petals. I just <3 it And in that time I love indulging in a scalp massage. ~ I USE 2Tspn OF COCONUT DEEP CONDITIONING OIL ~ 1 Tspn OF OLIVE OIL ~ 5 DROPS OF BADAM ROGAN 1.Mix them and apply gently focusing roots with finger tips till the ends. 2.After applying oil all over, I give myself a soothing massage. 3.Cover my hairs with a hot towel so that steam can do wonders. 4.Finish up bathing and then I apply the paste of METHI DANA(soaked over night and then grind to make paste). 5. Cover up with a shower cap and try not to let the paste dry. 6. The paste is sticky and a lil messy to rinse off. Rinse thoroughly with warm Water and shampoo. Being with a toddler baby and looking after my whole family, is a hectic job.. So whenever I get time (or atleast once in a month) I make a day (usually only just some time :P) for my self to spend with myself n pamper myself.. I start the my pampering with , First I Take fresh cream n put 1 string of kesar in it and now grind it with almond n keep aside. Now I take warm coconut oil and apply it all over my hairs and scalp. Now when the hair is done.. I take that cream and kesar mixture and apply it all over my neck and face and let it dry for sometime. This gives my skin natural glow and moisture, Which is best for winter. If I have more time Then I apply the above mixture to my body and let it dry too. For my Lips I use Pure Ghee to give them moisture. I do what My Granny always used to say to me to use lemon skin (left over skin after removal of juice) on my funny bone n around the neck, where it has become dark , so it would gradually make it normal to my skin tone. Then I concentrate on my Hands and legs, which need to be looked at, after all those running around my daughter. I take half bucket of Luke warm water and add salt to it and keep my legs in them for 10 mins and them I use foot file to gently smooth rough skin. As I have a small baby I usually don’t keep long nails. So after I have remove the all the nail polish from hands and legs, I exfoliate my hands with a mix of 2 tsp olive oil and salt n sugar. Then I cut my nails and keep them clean. Then in bath tub I add rosewater and coconut milk in it for some time and some rose petals also in the bath would be awesome. By listening my favorite songs, by closing my eyes I will relax. After all this I take head bath and just relax for some time and ready for the next home chores with fully pampered, rejuvenated and relaxed..
Hope you all will like my idea..